In this chance, we are going to compare Nikon D200 vs Canon 40D, which are two semi-pro DSLR cameras. These two models are of the same league. Each features a 10 MP image sensor with a pentaprism viewfinder and RAW support. However, Nikon D200 is actually two years older than Canon 40D, so certainly there are going to be discrepancies. Which is the better camera? Continue reading below to determine the one with the best quality and value for the money! Both Nikon D200 and Canon 40D are quite heavy, but this is certainly not a surprise since most DSLR cameras are indeed heavy. Nikon D200 is a little bit longer and heavier. It measures 147 mm x 113 mm x 74 mm, and the weight is about 920 grams. Nevertheless, Nikon D200 has a very good housing. It is solid and durable, and it is properly weather-sealed to allow usage in any environment. The weather-sealed body will prevent any dust or moisture from entering and damaging the delicate internal parts. Take a look at our previous post about Nikon D200 vs D300. On the other hand, Canon 40D is a little bit smaller and lighter at 146 mm x 108 mm x 74 mm, 822 grams. Unfortunately, Canon 40D is still without any weather sealing. As a result, it can be a little worrisome to bring this camera for outdoor uses, especially if the weather is unpredictable. Each of the two cameras is equipped with a fixed display screen and an optical pentaprism viewfinder. They can give you the framing control that you need to achieve the best shots. Canon 40D is slightly better in this aspect because it comes with a larger display screen, which measures 3.0”. Canon 40D also comes with a unique feature called Live View. In this mode, the camera does not auto-focus. But you can auto-focus temporarily in this mode by lowering the mirror. Nevertheless, the Live View feature is useful mostly in macro and studio photography. Nikon D200 comes with a smaller 2.5” display screen. Although the display is fixed, it has a very wide viewing angle. You can still read the display even from a 170-degree angle. Each camera has a built-in flash, an external flash shoe, continuous shooting, timelapse recording, and RAW support. Nikon D200 also comes with a flash sync port for connecting with an external flash. Canon 40D, on the other hand, offers a higher continuous shooting speed which makes it suitable for sports photography. In addition, it also has AE Bracketing, which is useful for HDR and in some tough lighting conditions. 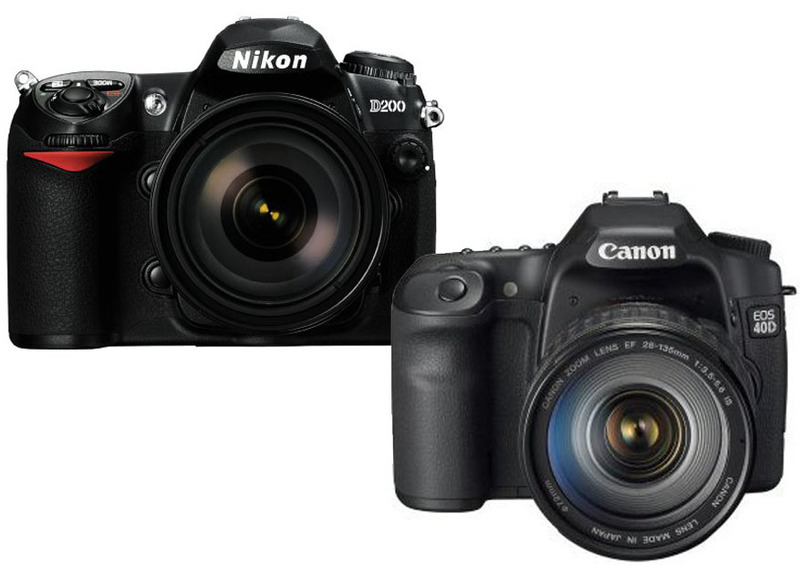 Nikon D200vs Canon 40D have the same resolution, but their image sensors are different. Nikon D200 still relies on the 10 MP CCD sensor. Nevertheless, the color depth and dynamic range are good. Canon 40D comes with the 10 MP CMOS sensor. It has an improved pixel design to increase the signal-to-noise ratio and sensitivity. Hence, you can expect better image quality here. The ISO performance is notably better, too. In general, Canon 40D is more recommended. It has a better sensor which offers improved image quality and ISO performance. It also has some nice features, such as AE Bracketing and Live View.